Early last Monday morning, as my husband, campaign manager, and I were standing on a median at the corner of Greenspring Valley Drive and Falls Road doing a campaign visibility sign wave, a man stuck his head out of his car window and yelled, "Heil Hitler! You do not represent us! Heil Hitler! You do not represent us!" about 5 times, in addition to a number of expletives. We were very fortunate that he kept driving and didn't get out of his car, but the experience was jarring. My colleague, Delegate Dana Stein, his wife, and a campaign volunteer, were standing on the opposite corner and heard the yelling. Later that afternoon, I shared the experience on Facebook and was contacted by J'More, a local magazine, and was invited to submit a blog post reflecting on the incident that you can read here. Shortly thereafter, The Baltimore Sun contacted me and wrote an article that appeared in today's print edition, but online Wednesday night. Within an hour of The Sun article posting, someone posted a picture of Hitler on my Facebook page and stated, "I read about you in the sun here is a true hero and leader. Let's hope trump does the same." The photograph of Hitler has disappeared from my page (I assume that's a Facebook security measure), but the words are still there. Over the past few days, we have received many wonderful comments of support from friends, colleagues, and community members, stating that they stand with us. We know this is NOT the face of our community -- not the 11th District and not Baltimore County. We also know that many in our community, by virtue of the color of their skin, who they love, or their religion, regularly face acts of hate and unkindness. And while our experience may not be unique, it does feel like something has been unleashed giving license to the haters to express themselves so brazenly. 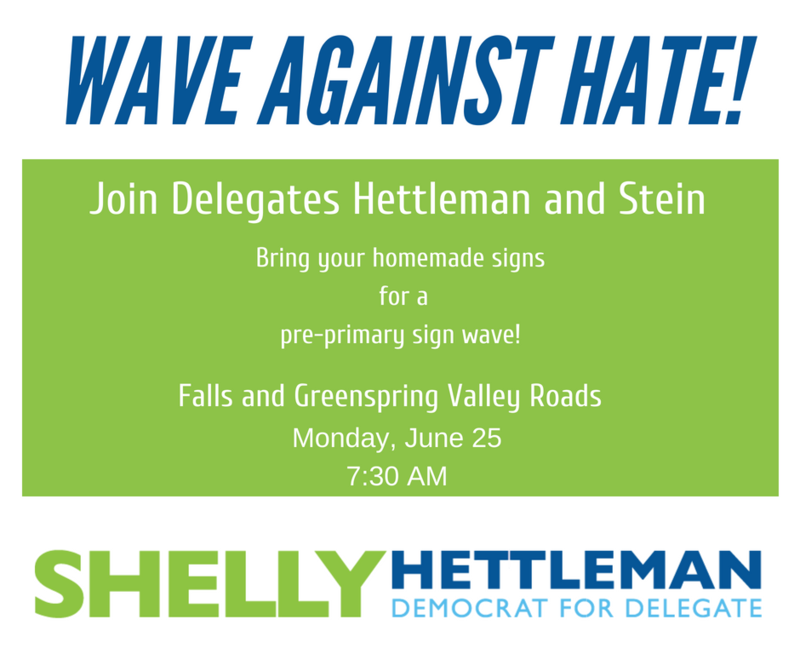 In a show of solidarity -- that we stand strong in the face of hate -- we invite you to join Dana and me for a sign wave on Monday morning, June 25th at 7:30 am. We're planning to go back to the same intersection -- at Greenspring Valley and Falls Road. Bring your homemade signs, your positive energy and your spirit. We hope to see you there! We still have a few open slots, can you commit a couple hours to help on Election Day? Whether you live in Pikesville or Cockeysville, Owings Mills or Ruxton, or somewhere in between, we need volunteers in your neighborhood polling place. And for those of you who live outside the 11th District, please join us. We need your support too! You can sign up to volunteer.